Today for the first time since the incident in Mustique we have sailed to a place we wanted to go for fun and it feels really good to be back on our adventures again. It’s actually kind of like we have pressed the reset button for me, I feel a renewed sense of excitement about the next period of our travel. 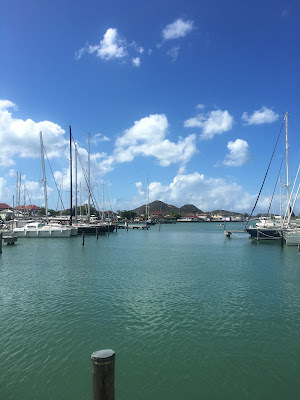 We stayed in Rodney Bay, St Lucia, until we had a fair forecast to head north to Antigua on 4th March. While we were there we planned what needed to be done when we got to Antigua and reached out to Oyster and our Insurance Broker for support. 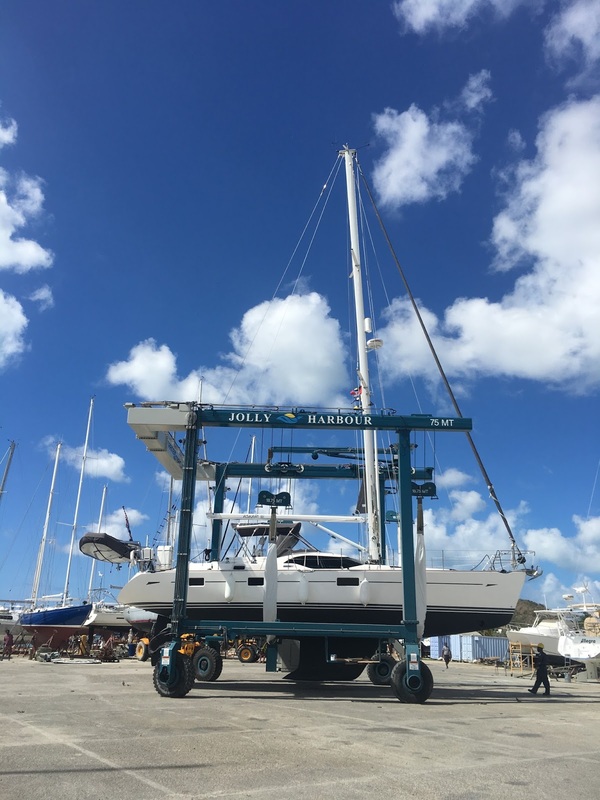 I also went up the mast for the first time to check the rig over after we had used a halyard to lean the boat over – nothing to report and I just did a bit of polishing and replaced some tapes on the rigging terminals – the view was pretty cool though. 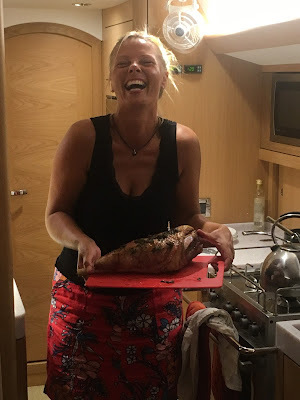 We also had some great fun evenings with friends – Friedl and Kathi made a dock BBQ for us one night and made homemade pasta for us another; I cooked roast lamb in return as we had to eat the contents of the freezer before hauling out as the freezer is water cooled. I went to a couple of yoga classes by the pool and I dragged Andrew on the bus to Castries to check out the market – where we ate lunch at Sylvia’s; Andrew’s Mum is Sylvia and she was delighted to learn this and invited us into her Kitchen. We also met the East Coast US experts – Maggie and Al on Sweet Dreams and Angela on John on Galadriel; we shared a few sundowners with these guys plus a fabulous steak dinner while they plied us with information all about their favourite places – so exciting! We left the marina early on Saturday morning and filled up with fuel before starting our journey north. We had decided to go directly to Antigua, the wind was forecast to be around 20 knots but nicely out of the east, which is what we mostly got, however as you pass either end of each island it was much stronger and north east or south east – however Askari sailed brilliantly and made about 8-9 knots nearly the whole way. We arrived just before mid-day in Jolly Harbour, Antigua. We immediately spotted Supertramp – Fi and Steve did big star jumps to welcome us! We cleared into Antigua at the Customs dock and then went into the marina at Jolly, helped in by William who had helped us in with ReVision II 12 years ago – we remembered him. John and Ellie from Serenity also came to help with our lines; it was like being home. Cartwheels after lunch - Steve?? The wind was pretty wild over the next few days and even when we were due to lift out at lunchtime on Thursday it was blowing in excess of 25knots, however with Steve and Fi’s help we got Askari out of the complicated berth, the Andrew expertly reversed her into the lift bay. This being our first lift out, we were quite anxious as the guys positioned the slings, however the chaps were excellent and we need not have worried. 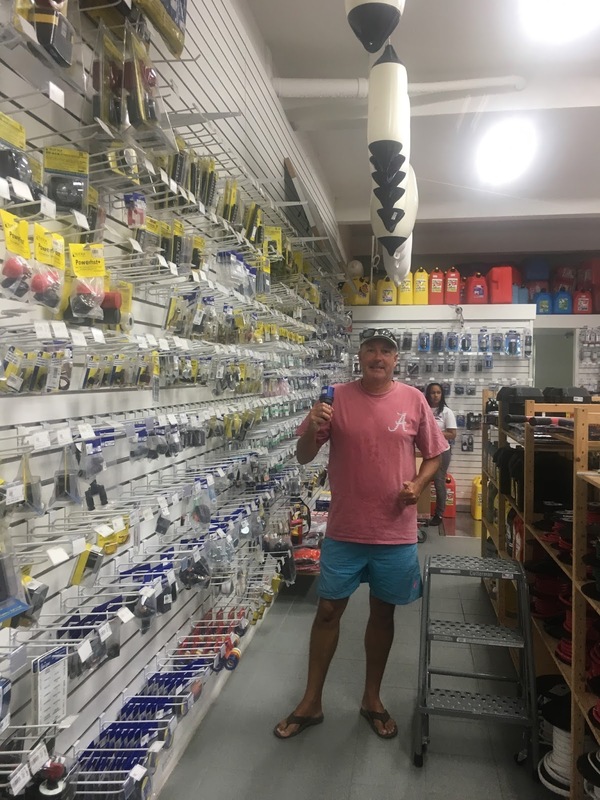 Lindsay is an excellent Boat Yard manager and his team are first rate. 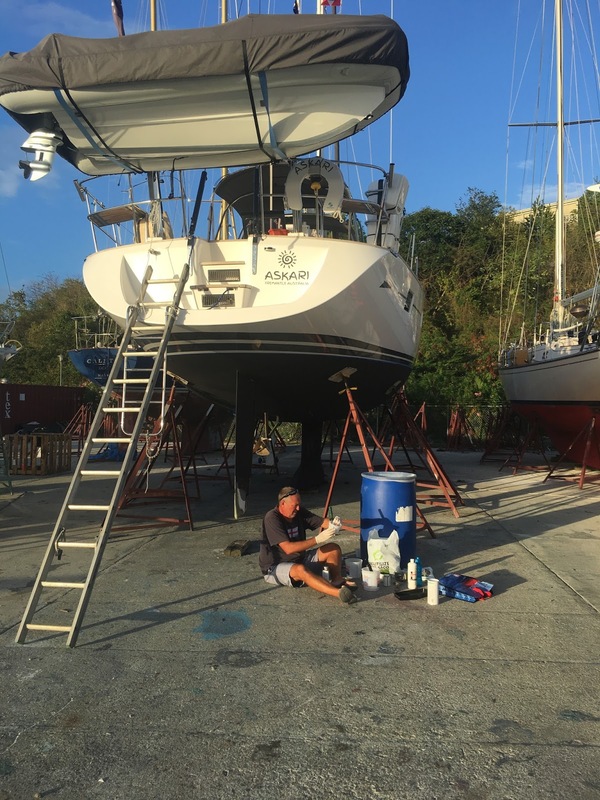 We inspected the rudder and keel and were pleasantly surprised – this was not anywhere near as bad as we thought having seen it under water. So we went for lunch while they pressure washed her and chocked her off in the yard. Andrew cleaned up the rudder ready for survey on Friday afternoon then set about filling the void with epoxy and a fibreglass bandage over the next couple of days. Once he’d done and Jesse and painted and polished Askari she looks as good as new – actually better!! All done on Sunday afternoon Fi on Supertramp cooked up an amazing Sunday lunch – just what we needed. 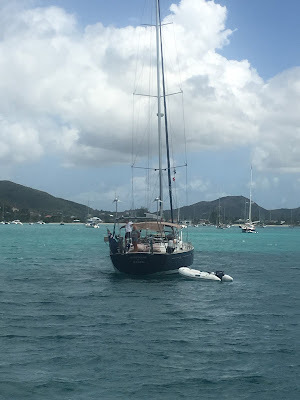 Monday afternoon – splash – she’s back in the water and we went out for a short ‘seatrial’ (boat builder’s joke) and then anchored off in the gorgeous Jolly Harbour for a swim and a sundowner – yay! Tuesday a big re-provision, as we cannot use our fridge or freezer on the hard we had to start from scratch – luckily there’s a great supermarket in Jolly Harbour which has lots of great stuff including bacon and sausages for the first time since we left Europe – Andrew is happy. We had one more quiet night at anchor in Jolly Harbour before motoring the 10 miles down to Falmouth Harbour this morning…..